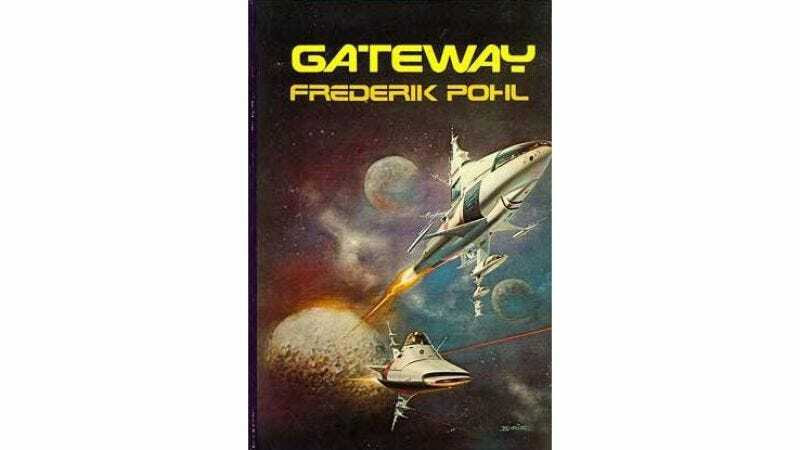 Lurching back into the “credible” portion of its normal hard science fiction/blood-powered cars emotional cycle, Syfy has announced that it’s teaming up with Battlestar Galactica EP David Eick for a TV adaptation of Frederik Pohl’s Gateway. The 1977 novel, which spawned five sequel books and a pair of surprisingly great text-based adventure games, centers on humanity’s discovery of an alien space station with the ability to launch semi-automated scout ships at velocities exceeding the speed of light. As much a psychological drama as a science fiction odyssey, Gateway focuses on the experiences of explorer Robinette Broadhead, who was emotionally crippled during the same interstellar expedition that made him one of the solar system’s wealthiest men. According to Variety, Syfy’s Gateway series will follow the same model as the book, albeit with a likely eye toward more interplanetary journeys and alien encounters than the relatively restrained original novel. The pilot script for the series was written by Josh Pate, the creator of ABC’s upcoming modern-day oil rush series Blood & Oil (starring Don Johnson, and previously known as both Boom and Oil before Big Ampersand got its fingers into the pot). Showrunning duties will be handled by Eick, best known for executive producing and co-writing the Peabody and Emmy-winning Battlestar Galactica reimagining, alongside his cartoon nemesis, Ronald D. Moore.